Please note: The ticket office closes at 16:00. Free admission tickets are provided to visit the Han Meilin Art Gallery. Individual visitors receive free tickets with valid ID at the ticket office. reservations in advance at least three days through telephone or official website. Courteous Chinese and English language guides are available upon request. Wheelchairs and baby carriages are available upon request. Video and photography inside the exhibition halls are not allowed without permission. Please protect the facilities and do not touch the exhibits. Please remain quiet and do not smoke inside the gallery. Those under the influence of alcohol or improperly dressed are not allowed. 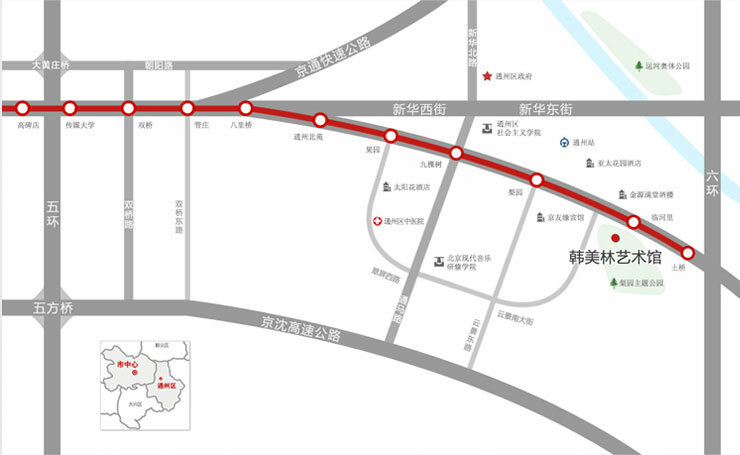 Via private car: get out of the Beijing-Tongzhou Highway through Baliqiao toll station, and drive along the Beijing-Tianjin Highway i.e.